Draft: 1995, Chicago Cubs, 1st rd. May 19, 2012 RHP Kerry Wood retired. May 3, 2012 Chicago Cubs activated RHP Kerry Wood from the 15-day disabled list. April 20, 2012 Chicago Cubs placed RHP Kerry Wood on the 15-day disabled list retroactive to April 14, 2012. Right shoulder fatigue. 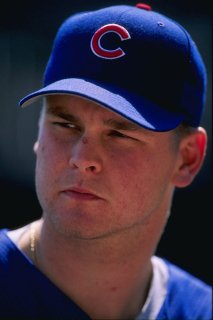 January 13, 2012 Chicago Cubs signed free agent RHP Kerry Wood. October 30, 2011 RHP Kerry Wood elected free agency. July 1, 2011 Chicago Cubs activated RHP Kerry Wood from the 15-day disabled list. June 13, 2011 Chicago Cubs placed RHP Kerry Wood on the 15-day disabled list retroactive to June 9, 2011. Blister on his right index finger. December 17, 2010 Chicago Cubs signed free agent RHP Kerry Wood. November 7, 2010 RHP Kerry Wood elected free agency. July 31, 2010 Cleveland Indians traded RHP Kerry Wood to New York Yankees. July 31, 2010 RHP Kerry Wood roster status changed by Cleveland Indians. July 29, 2010 sent RHP Kerry Wood on a rehab assignment to Akron Aeros. May 7, 2010 Cleveland Indians activated RHP Kerry Wood from the 15-day disabled list. May 3, 2010 sent RHP Kerry Wood on a rehab assignment to Akron Aeros. April 4, 2010 Cleveland Indians placed RHP Kerry Wood on the 15-day disabled list retroactive to March 26, 2010. Strained right latissimus dorsi muscle.